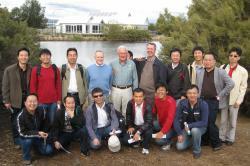 The 19 emerging leaders from the Yellow River Conservancy Commission (YRCC) who have been studying in Adelaide since February are on the final stretch of their water resources management programme. Now at the end of their university-based studies, having completed exams, the group is currently undertaking two-week industry placements ahead of a 10-day study tour of South Australia, the Snowy Mountains Hydro Scheme, the Murray-Darling Basin Authority, Sydney Water and the National Water Commission.Previous groups from the YRCC have found the industry placements a very important and enjoyable feature of the programme, as it gives the opportunity to experience and contribute to Australian work practices, identify areas of complementary interest and learn more for their own personal and professional development. After completion of the industry placement, an ‘action planning’ process will be held in which the staff, drawing upon their academic and practical experiences, sit down to discuss and develop plans for implementation upon their return home. This provides additional opportunities for development for the YRCC as an organisation. Many of the visitors from the YRCC also managed to find time to sample some of Australia’s tourism hotspots, including Uluru, Alice Springs, Sydney and Melbourne. The Yellow River is a crucial part of China’s economic development. It serves 12 million hectares of agricultural land and is an important source of hydro-electric power.